Keitha Caldwell was able to buy a fixer-upper in Detroit for $17,500. Detroit took a massive hit during the 2008 financial crisis, and to this day, many residents can’t afford the down payment, mortgage and other costs associated with owning a home. That’s partly why renters still outnumber homeowners in the city. 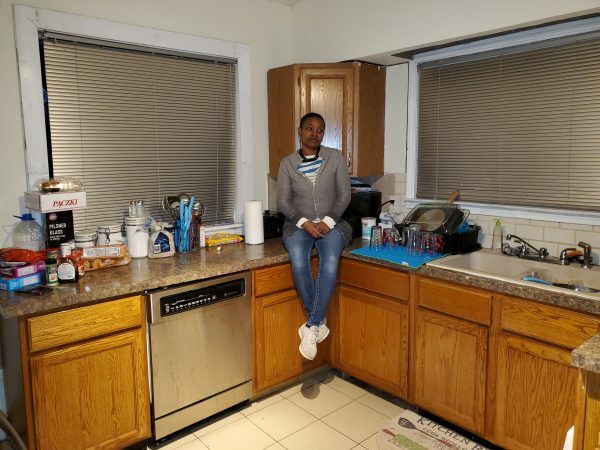 However, some have become homeowners in unconventional ways: Keitha Caldwell was able to buy a fixer-upper for $17,500 after winning a lawsuit against her former employer over a workplace injury. The 38-year-old retail manager and single mother of two, who eventually had to move in with her parents after the injury, saw the purchase as a ticket to independence. I’ve been here forever. Detroit is where my family is. It’s where I was born and raised, and it’s what I know. Why did you decide to buy a home in Detroit? I got injured at my job in December 2016 and had to be off of work for 22 months. I could no longer afford rent because I had no income, so I had to move in with my parents. I also have two kids. Because of my injury, I sued my employer and in November of 2018, I received $21,297 from the lawsuit. I felt like it was time to regain my independence. I thought the best thing I could do was pay cash and purchase a home. I didn’t want to worry about housing ever again. Initially, I just wanted something located between my daughter’s high school and my job. I didn’t care about what the house looked like or how many bedrooms it had, but it was a big deal for me to have a yard because I love being outside. I got injured at the end of 2016 and could no longer work. My rent at the time was $800 per month, but I had exhausted all of my savings, and after 13 months, had to move in with my parents at the beginning of 2018. Almost a year later, in November 2018, I closed on the house and moved in the week before Christmas. It took me a month to look at 50 houses. I would go out twice — sometimes three times — a week to look at homes. I was out looking from the time I dropped my daughter off until she was done with school. The first home I saw had everything I needed, but I wanted to see more. After seeing several additional homes that were missing so many important things, I decided to put a bid on the first one. I got it the next day. The house has everything I needed. It has five bedrooms and two baths. It does have two major issues (gutters and plumbing problems), but everything else is cosmetic. It also has a nice backyard, but I do need a fence because I have little dogs. Keitha Caldwell inside of her kitchen. Because of my injury and being off of work, I was really frugal and in survival mode. I used cash from the lawsuit against my former employer to pay for the home. When you use cash, it’s a faster process versus using a lender. I paid for it all upfront. My budget was under $20,000, which is normal for fixer-uppers in Detroit. The home started off at $16,000 and ended up at $17,500. Closing costs were included. And two months before I purchased the house, my doctor let me go back to work [at a new company]. I actually would do this all over again because even though the home needs some work, it’s livable and I have a vision of what it will look like when all the improvements are done. I think I bought a house at the right time. What advice would you give to someone considering moving to Detroit? Make sure you get your home inspected. Get a walkthrough and see what you’re up against before you take on a fixer-upper. Perrin Emanuel, a real estate agent in Detroit, shared a few key tips for first-time buyers. There are programs to help low-income families become homeowners. “A lot of banks are participating with state programs to help money out here,” Emanuel says. A few of these are Well Fargo’s HomeLIFT program, the Detroit Home Mortgage program and the Wayne County Home Buyer Program. The article How I Bought a Home in Detroit originally appeared on NerdWallet.